I would just like to wish a very Happy Christmas and New Year to all my customers and faithful followers who have taken the time to leave me such lovely comments throughout the year - thank you. 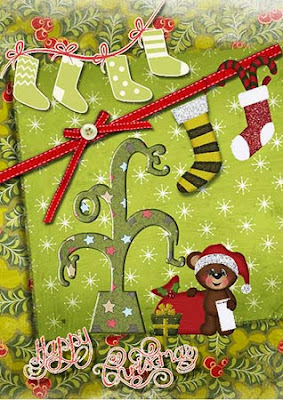 This is my card to you and if you would like the little Noel Tree cutting file you can download it below. Maybe a little late to use this year but there's always next Christmas !! thank you Shirley for thisChristmas gift! Your generosity is appreciated. i hope you and your family have a wonderful holiday. May it be sweet! Thank you Shirley,I love your card and your gifts through out the year. A lovely fun card, thank you. Christmas Greetings to you and yours. Merry Christmas Shirley, and thank you so much for all that you share throughout the year. You create the most beautiful designs. Thank you Shirley, not just for this but your freebies all year, some are in my "box" to be done others have been used, but all are lovely designs. Happy Christmas and a fruitful 2014. Thank you for the gorgeous files you have shared so generously with us over the past year. You're a doll...thanks for your generosity.